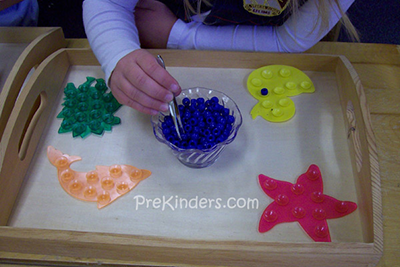 Fine Motor Skills is one of the main areas I sought to improve in my Pre-K classroom this past year (2008-09). 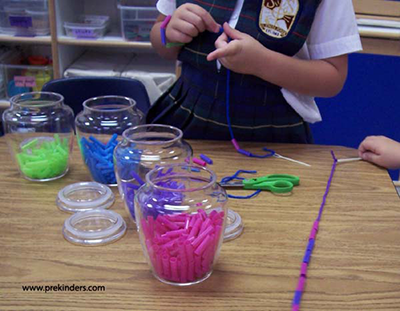 I think fine motor is an area which is often overlooked, yet it is so important. Fine motor skills are the foundation children need before they learn handwriting, in order to have proper pencil grasp and control of a writing instrument. 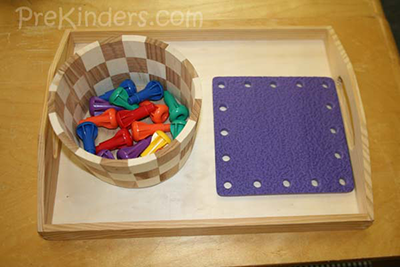 My goals were to increase the fine motor materials available in our classroom environment, and to plan activities and materials that are interesting and fun so that children would be motivated to use them and would choose them during their free choice time. Most of these activities use “found materials” that can be borrowed, donated, or purchased inexpensively, rather than commercially produced and sold in an educational catalog. Below are several of the fine motor skills activities my class did this year. A few of these ideas were borrowed from Montessori (and I’ve noted those below). 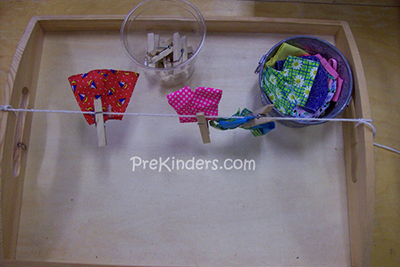 Children use their fine motor muscles to squeeze the clothespins to clip each piece of clothing to the clothesline. I tied a piece of thick string to the handles of a wooden tray to make the clothesline, and used mini clothespins (although the regular sized clothespins can be used as well). The clothes are Barbie doll clothes purchased at a dollar store. As an alternative, you could cut out shapes of shirts and pants from felt. 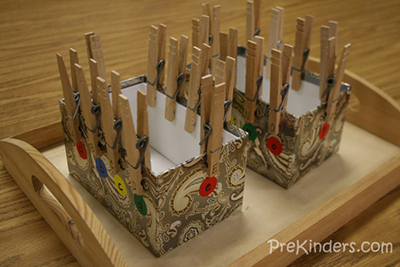 Children squeeze the clothespins and clip them to the sides of the box. To make the activity more interesting, I wrote letters on dot stickers and placed the dot stickers around the sides of the boxes. I wrote letters on the clothespins so the children would match the letters on the clothespins to the letters on the boxes. Other skills could be used, e.g. colors, numbers, beginning sounds. This is similar to activities where children clip clothespins to a paper plate or cardstock circle; however, in my experience, those were flimsy and awkward to use, which is why I like the box better. Any sturdy box could be used (shoe box, postal box). The boxes in this picture were stacking gift boxes that held chocolate covered nuts (a Christmas gift), and they worked out perfectly. These larger nuts and bolts can be purchased individually at hardware stores. The cost is usually no more than $0.40 to $0.50 each. Children use their fingers, hands, and wrists, coordinating both hands while grasping and twisting the metal nuts onto the bolts. 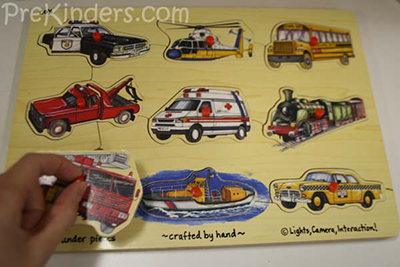 These can be purchased or made with poster board and a hole puncher. Use shoe laces or plastic lacing. Tie one end of the lace to one hole of the card. Children lace the string through each hole. These can be made to match different themes or holidays. Tie lengths of yarn to plastic yarn needles, and knot the end. Children “sew” the yarn on a styrofoam plate by pushing the needle in and out through the plate. Cut plastic drinking straws into small pieces, about 1-inch. (Cutting the straws is another great fine motor activity for kids.) Tie yarn to a plastic needle, or use plastic laces, and knot the end. Children string the straws onto the yarn or lace. 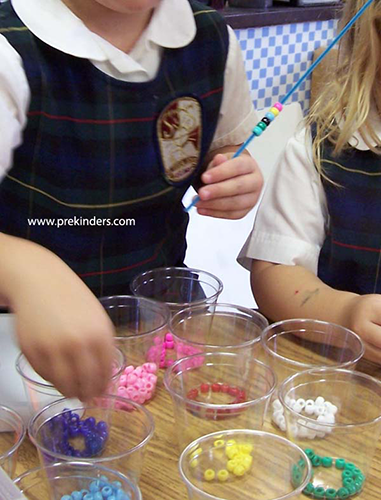 Children string pony beads onto pipe cleaners. 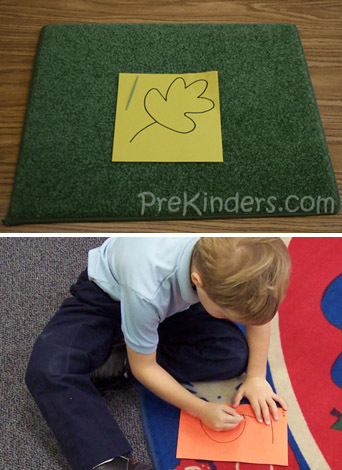 Children draw a simple picture on a piece of construction paper with a pencil. They trace the pencil lines with glue and glue the beans onto the design. 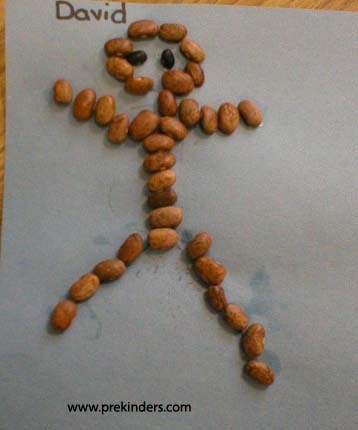 Gripping the beans with their fingers is good fine motor practice. 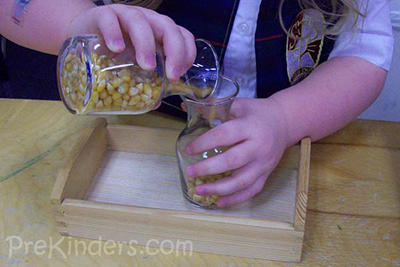 Children pick up different types of seeds with tweezers and sort them by type into the cups. Children push the cubes with their hands to hook them together. Unifix cubes connect on one end and can make a long “train”. Interlock Cubes connect on different sides and can make different things, for example the dogs the children were making in the photo. In advance, cut construction paper into 1-inch long strips. Children “snip” the strips into smaller pieces and glue them onto their paper to make a mosaic. This activity is great for children who are not yet skilled with scissors, but need cutting practice because they can snip the paper with one cut. 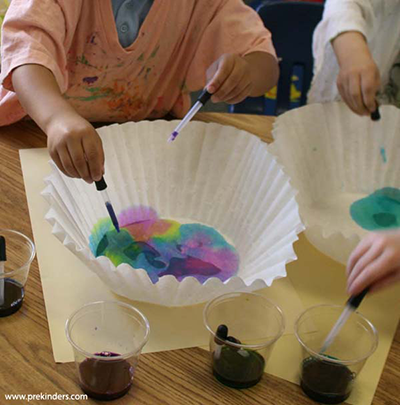 Children use eyedroppers to drop liquid watercolor onto a coffee filter or paper towel. (I use Colorations Liquid Watercolor from Discount School Supply.) If liquid watercolor is not available, you can color water with food color. Also see my blog post for adapting this activity for holidays or themes. 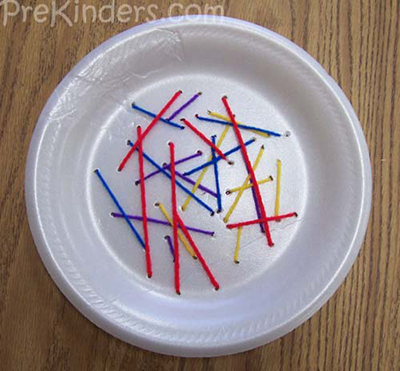 The children in my class are always wanting to use paper clips because they see me use them, so I set up this activity in the fine motor center. I cut squares of colored construction paper and placed them on the tray along with colored paper clips. 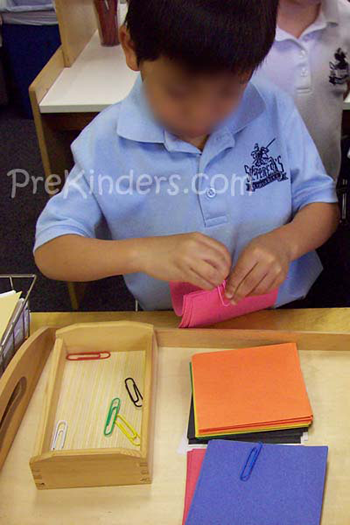 Children stack the papers (all of the same color) and clip them with the matching colored paper clip. This was challenging for some children to manipulate the paper clip, but they loved doing it, and it gave them an opportunity to use paper clips with permission. I printed out the Geoboard Dot Paper from the Math Their Way website for this activity (I used the size on the second page). I added Pip Squeak markers, which are great for young children because they are short. 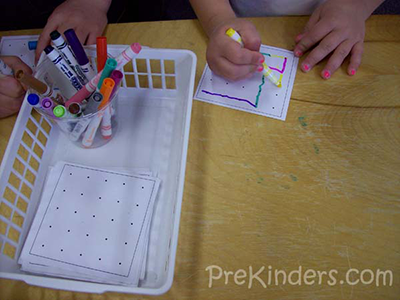 Children draw lines with the markers to connect the dots on the paper. 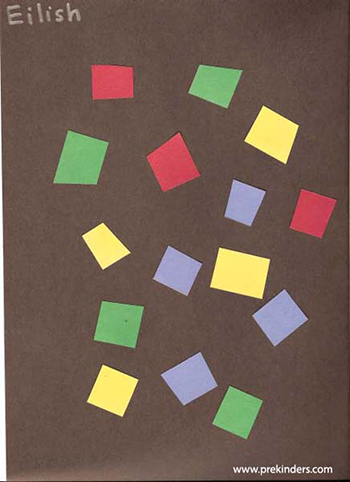 To do this activity, cut squares of construction paper (I cut mine 6×6 inches). Draw a numeral, letter, or simple shape with a Sharpie. 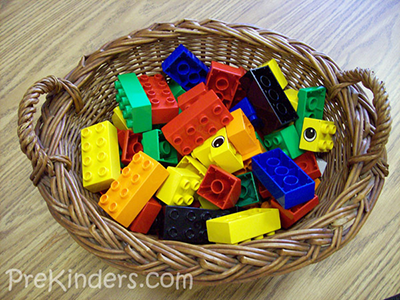 I placed a stack of these papers in the fine motor center, along with toothpicks and a carpet square. Children place the paper on the carpet square and use the toothpick to punch holes all along the black lines. When they are done, they can hold their paper up to the light and see the light shining through the holes. 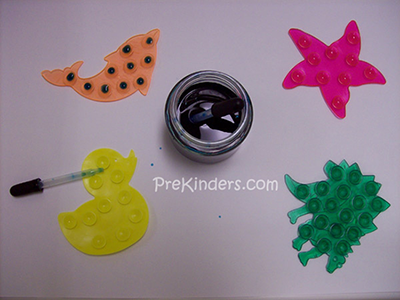 Kids enjoy it and it’s great fine motor practice! Sand art is a great fine motor activity because children can pinch the sand with their fingers to apply it to their art work. Provide a simple outline (or have the children draw one), a small bowl of white glue, a small bowl of colored sand, and a “glue brush”. I buy the cheap paintbrushes with stiff bristles that are sold in a package for $1 at dollar stores. These brushes are not a good enough quality for painting, but they make great glue brushes. Children paint the glue on their paper with the brush, pinch some sand with their fingers, and sprinkle it over the glue. Place a pan, tray, or paper plate on the table for children to shake off the excess sand. Children wrap the plastic insects with pieces of white yarn (“spider webs”). When they are finished wrapping all of the insects, they unwrap them and place the yarn back in the bowl. We do this activity during a study of bugs and spiders. 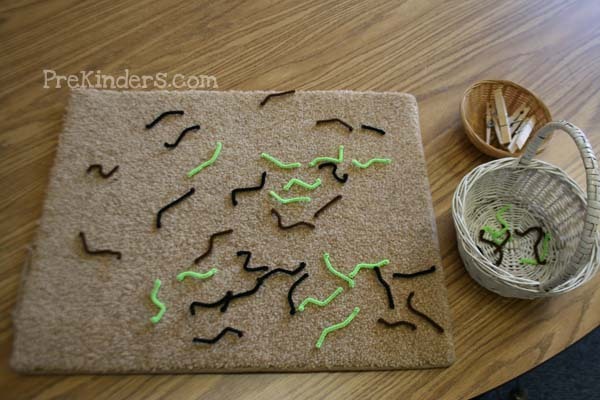 Cut pipe cleaners into smaller pieces and shape them to make several “worms”. Place the worms on a brown carpet square (this represents the dirt). 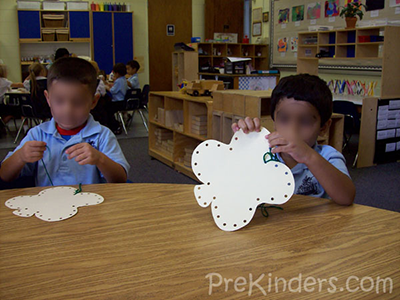 Children use a clothespin as a bird beak and catch the worms with their beak. As they catch worms, they place them in a basket until all of the worms have been collected. Children scoop the marbles with melon scoops and place them in the ice cube tray. This ice cube tray was found at a kitchen discount store. 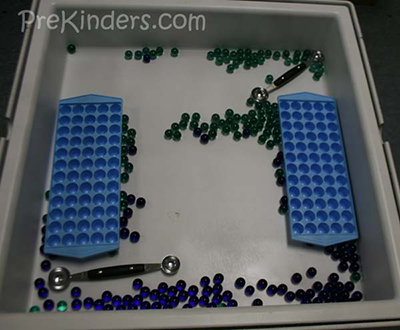 Also posted at Fine Motor in the Sensory Table. 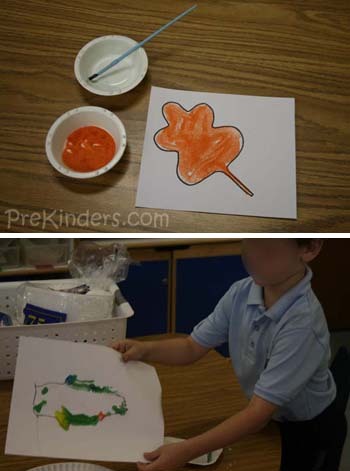 See my blog post for a Halloween adaption to this activity. Children pour something from one bottle to another. I started out having them pour popcorn seeds. They can later try pouring sand, and then water. 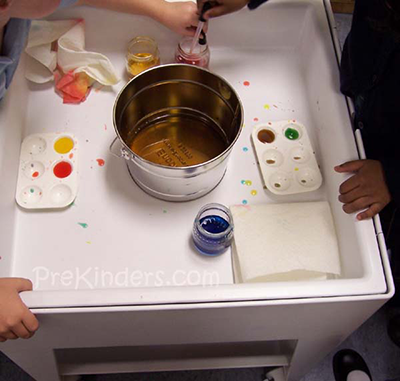 Children mix primary-colored water to make secondary colors. The bucket in the middle is for dumping the water when finished, or to start over. Also posted on the Sensory Tablepage. 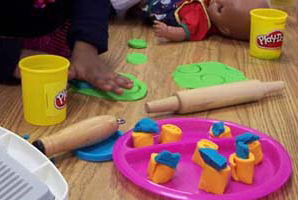 Children exercise the fingers used for a pencil grasp when picking up puzzle pieces that have knobs or pegs. A bit obvious, but should not be forgotten. An old stand-by. Also see my webpage for more play dough activities.